Home water heaters review explains the most popular types and systems for potable water heating in residential homes. Explore the main features, advantages, and disadvantages of the gas, electric, solar, RV, tank and tankless units, including boilers and heat pumps. The article provides the information about different systems and technology used in water heating, covering tankless, tank-type, hybrid, condensing, tankless coil; fuel sources, and the major manufacturers. Either you are buying a brand new or replacing the old water heater, this review will help you with the general information, such as this infographic. By selecting the right heater type for your home, you will select a unit that will not only provide sufficient amount of hot water but the one that will be energy efficient saving you on energy bills and water consumption. Storage tank type water heaters are found as the standard or conventional type and these are the most popular type in US and Canada. In Europe, these are known as cylinders. The heaters use the insulated metal tank where they store hot water which is always ready for use. The tanks are ranging in capacities from smaller such as 2 gallons to over 100 gallons, where the 40- and 50-gallon sizes are the most popular. Those with the smaller tanks are also known as point-of-use (POU) while larger are called whole-house. The main advantages are the lower price, proven technology, powerful burners and heating elements, low water flow and reduced "cold-water sandwiching." The major disadvantages are the standby heat loss, water is heated even if not used, big size and inability to repair when leaking. They come with the warranties from 6 to 12 years while the life expectancy is 10-12 years, sometimes more than 15. 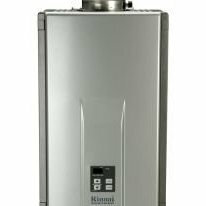 There are three major manufacturers of home water heaters in North America: AO Smith, Rheem and Bradford White, and brands such as American, State, Reliance, Whirlpool, GE, Kenmore, Ruud who are linked to the above three producers. Tankless water heaters heat water on demand, only when there is a need or call for hot water (when the tap is open). Standby heat losses are eliminated as there is no storage tank, and the heater provides hot water in endless supply, as long as it is needed. With the tankless heaters, you never run out of hot water but the flow is limited, and the heating elements or burner draws a lot of fuel. They are small, usually wall-mounted, and gas units can be installed indoor or outdoor. Indoor gas models are usually designed with the sealed combustion, which allows installation anywhere inside the home. Gas tankless is more efficient than tank-type, but the initial cost is higher. They are ideal for larger homes and families where the demand for hot water is high. Electric tankless such as Tempra from Stiebel Eltron or Hubbell marine are even smaller. Hybrid home water heaters are heaters that combine two technologies, such as the electric heating and heat pumps. You can also find the combination of the tank and tankless technology as found on AO Smith Next model. The main advantages are the high-energy efficiency and performance while the cons are the high purchase and installation prices. Hybrids are ideal in warm climates, but not in cold spaces. They can provide both heating and cooling. Tankless coil does not require a separate storage tank since water is heated directly inside the heat exchanger and inside the boiler used for home heating. The greatest advantage of the tankless coil is getting the hot water when the home is heated, where the highest efficiency can be achieved during the winter cold days and months. During the warmer days, the efficiency drops significantly since there is no need for home heating. As the name indicates, indirect water heaters heat water indirectly. Water is heated in the boiler and then circulates through the heat exchanger which is located in the separate insulated storage tank while transferring the heat to the surrounding water. These are usually made of stainless steel, to last longer while heating space and water at the same time. The condensing technology allows either tankless or tank-type water heater to capture hot exhaust gases that would normally go out the flue vents, and utilize the heat for water preheating. Check out more about condensing technology and top models. Gas water heaters can use natural gas or liquid petroleum (LP or propane). Natural gas is more convenient to use as the propane gas requires propane tanks and frequent delivery, making it more expensive. Gas heating is affordable and environment-friendly heating, while the electricity is more expensive, and if it is made by the nuclear or coal plants, it is bad for the environment. Gas-powered home water heaters heat water faster, and the first-hour delivery is higher than the one found on the electric type. This group offers a variety of types and models, which includes atmospheric, direct-vent, power-vent and power-direct vent models. The new condensing water heaters are becoming more and more popular due to their advanced features and ultra-efficient heating. Smaller propane gas water heaters are mainly used for heating water when camping or use in RV (recreational vehicle). Electric water heaters are simpler by its construction than the above gas units. While they usually have higher EF, their first-hour rating is lower, and they are less economical to operate. The most popular models are coming from the group of point-of-use heaters, which are mainly used for delivering hot water to one fixture. Home water heaters that are powered by the Sun’s heat are expensive, but the operating costs are lower and the fuel is free. Solar water heating systems (SWHS) are reliable, durable and when properly installed provide enough hot water - especially in southern regions while in colder areas can be used as the backup or supplementing the existing system. SWH systems are designed as active or passive systems, and if you are a handyman you can even make your own, using the guide also found here. Oil-fired water heaters are similar to traditional electric or gas type but include an oil-powered burner. They are designed to heat large amounts of water – quickly, with the greater efficiency and recovery rate. Water can be heated directly from the burner or indirectly, by hot water from the boiler. 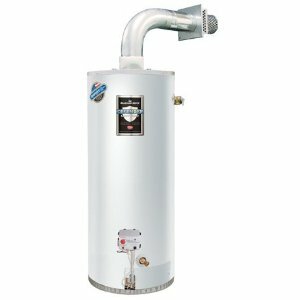 Water heater booster - speed up delivery and provide energy improvement that saves you money and water. Size – most tank-type water heaters are bought based on the capacity or how many gallons of water they can store. The most popular sizes, for the family of four or mid-size homes, are between 50 and 80 gallons. First-hour rating (FHR) found on storage tanks (flow rate in GPM on tankless) - this is what shows how much hot water a unit can deliver in one hour or how many fixtures your heater can supply during the peak time. Energy Guide label found on every model gives you the information about the FHR, capacity, annual energy use and the annual cost to run the unit. As seen from the above, there is a water heater type for almost every home, either you have an access to gas, electricity or live in southern sunny or northern cold regions. If your water heater is 10 years or older, you might want to consider buying a new, more efficient one, with the latest safety and advanced features. Especially if you live in the area with hard water. Keep in mind that around 20% of the total home’s energy usage goes on water heating alone. Selecting the best home water heaters should not be done in a hurry since the cost of purchasing, installation and operating one unit varies greatly between the models and manufacturers. Use this website for buying, selecting tips and guides.